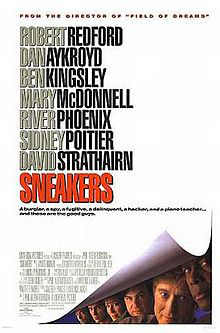 In the upbeat surveillance thriller “Sneakers,” (1992) a group of security specialists are asked by the National Security Agency (NSA) to steal a code-breaking machine capable of hacking the encryption of nearly every computer system. Upon recovering the device, the security specialists discover the agents who hired them aren’t who they claim to be and intend to use the machine for their corrupt schemes. Martin ‘Marty’ Bishop, played by Robert Redford, oversees the team which consists of Donald Crease (Sidney Poitier), Darren ‘Mother’ Roskow (Dan Aykroyd), Carl Arbogast (River Phoenix) and Irwin ‘Whistler’ Emery (David Strathairn). Mary McDonnell plays Redford’s former girlfriend Liz who reluctantly agrees to help his team acquire the device. Ben Kingsley plays Cosmo, Redford’s former friend and the villain of the movie. A positive aspect of this film is its humor. The jokes aren’t outdated or too juvenile for adults to enjoy. The playful mood and moments of sudden tension generate incredible excitement. In one scene, Redford is enjoying a game of Scrabble; the next, he witnesses a murder. “Sneakers” seamlessly switches back and forth from thriller to comedy but, unlike “Die Hard” or “Pulp Fiction,” “Sneakers” has scenes entirely dedicated to comedy, and scenes wholly devoted to thriller and suspense. While “Sneakers” was released almost 20 years ago, it doesn’t come off as far fetched or irrelevant by today’s standards. A tiny device used to hack into any computer to cause massive disasters or manipulate bank accounts sounds more believable today than when this film was first released. Also, the filmmakers didn’t over dramatize what the hackers are doing. They just type and read program codes. That’s it. No three-dimensional diagrams or ridiculous computer animation is used to make computer hacking seem like some sort of out-of-this-world science fiction fantasy. “Sneakers” is now available on Netflix. Anyone who enjoys rare ensembles, espionage, hot suspense and simple comedies will enjoy this informal light-hearted thriller.